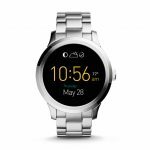 The Fossil Q Founder is the first smartwatch from the traditional watch maker. 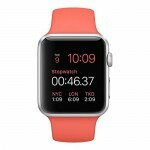 It�s powered by Android Wear which means it offers an experience just like other watches powered by the OS. It has a round 1.5-inch touchscreen display, operating at 360x325 pixels. Basic activity tracking is available, although there is no heart-rate monitor. It will sync with Android and iOS phones to deliver notifications and alerts on your wrist � emails, texts, calls, and more. The body is made of stainless steel making it more durable than your average watch.